Two of Salt Lake City’s favorite holiday shopping experiences are back and bigger than ever—and just a short walk from your classroom, office or dorm. 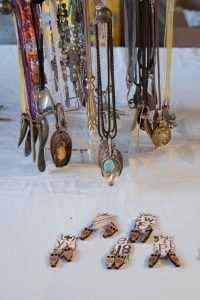 The Utah Museum of Fine Arts (UMFA) and the Department of Art and Art History at the U host their annual holiday sales early next month, offering shoppers a lively selection of locally inspired art gifts you won’t find anywhere else in town. Not only are these sales convenient, but they’re also a fun way to support campus arts. UMFA’s popular Holiday Market expands to two days this year, Saturday, Dec. 1-Sunday, Dec. 2, from 10 a.m. to 5 p.m. Choose from silk scarves, pottery, leather journals, notecards, handmade soaps, fused glass, paintings and prints, books, artisanal confections, jewelry, and fiber and textile arts from 22 local artisans. Enjoy live music by student musicians from the School of Music’s Red Hots performance program while you browse. Free parking and complimentary gift wrapping is provided. Admission to the market is free (and U faculty, staff and students are always admitted free to museum galleries, thanks in part to Arts Pass). Shop art-inspired items year-round at the museum store or give the gift of unlimited art access with a museum membership. Members also receive a 10 percent discount at the store. The Department of Art and Art History’s highly anticipated holiday sale at Gittins Gallery runs next week, Tuesday, Dec. 4-Friday, Dec. 7, 10 a.m. to 6 p.m. Shop ceramics, prints and other hand-crafted items made by artists in the department. Proceeds help support art clubs, visiting artists and other student benefits. 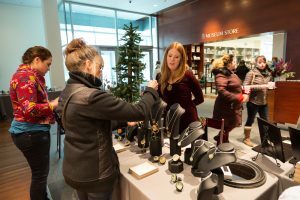 And don’t miss these holiday shopping opportunities elsewhere on campus: at gift shops at Fort Douglas Military Museum and Natural History Museum of Utah, plus Red Butte Garden and gift shop’s holiday open house and art fair.